Watch the video of "Knight's honor"
During the year 2018, the castle will put The "Kgnicht in honor". Today, who says Middle Ages said knight! This hero of the ancient time represents bravery, courage, honour, courtesy and protection of the weak-willed persons. MANAGE A DOMAIN with the intendant Knight : When he is not at war, the knight administers his domain where he spends most clearly of his time. A thousand things to manage : finances, economic management of lands, men and women at the service of the castle. And to be admitted by all, his family, his staff and his men-et-arms, he must also be able to receive in his castle and look good in the eyes of all those around him. GET AN EDUCATION AND SEDUCE with the courteous Knight : The knight grows, learns and gets his education in the "court « of the castle. This "courteous « knight grants to a big place for "fine amor". It is necessary to him to control its taste for feasts with songs, dances, musics and poems as well as beautiful dresses. A chivalrous way of life to win the heart of his lady and to ensure descendants by advocating obedience, devotion and fidelity. TRAIN FOR BATTLE with the warlike Knight : The knight was born in the comfort of the castle, but it is on the battlefield that he will surely die .... To become a knight warrior, he is to make his classes, to train, to study treaties and strategy of battle, to equip itself while leading an army of men-at-arms to win war or simply to defend his castle. And throughout the weekends of July and August, in honour, portraits of "knight" for all: dubbing, jousts, entrainement, harness, love affairs, games, entertainment, etc.... A season which promises to be epic and chivalrous! During the year 2017, the castle will present « Table stories ». “Set the table” with the bread master: le panetier, as the castle’s officer of food, is responsible for bread and place settings. He is also an authority on good manners, customs and traditions concerning large banquets at the court. A very knowledgeable man, his skills cover the content of the plate, the art of entertaining, status of the guests and finally management of domestic staff. 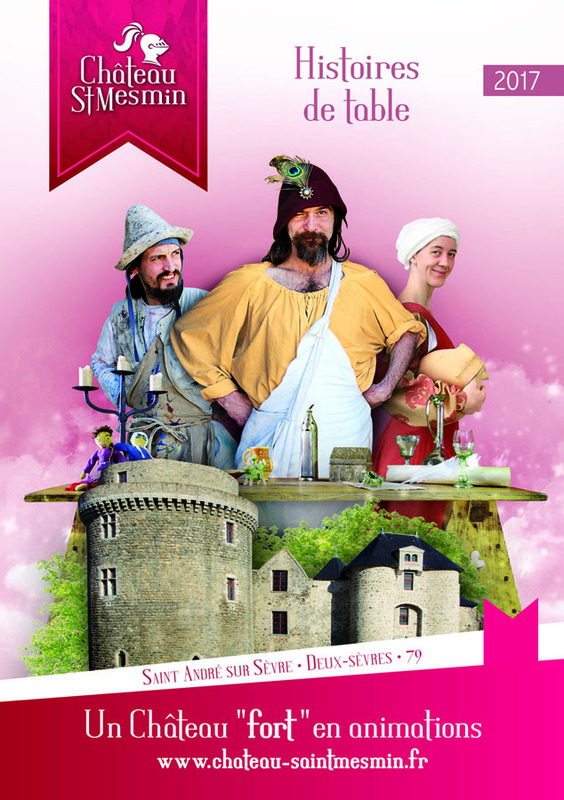 With le panetier, explore the table in the lord’s private residence of the castle! Read the “table of contents” with the scholar: The nephew of the owner of Chateau Saint-Mesmin, a keen traveller, when the fancy takes him, has met many artists and philosophers. Back from Italy, he is very impatient to present artistic experiments, techniques and expertise on the tables of the chapel. With the “budding” artist, switch between art and crafts and gather round the table to discuss objects and materials in order to give free rein to your creativity: mosaics, stained-glass window-making, painting and pigments. “Lay your cards on the table” with the gambler: The gambler (le parieur), a person from a good family with a comfortable income, is an educated man. Trader, merchant, he also sells forms of entertainment. Opening his treasure chest in the court of the castle, he is a purveyor of dreams with his games, defying the authority of the Church and making a pact with the devil. Join the gambler, both player and referee, and participate in tactical, physical and mental skill games. And throughout the weekends of July and August, there will be “table stories” for all with, on the programme: stories, magic school, banquet, inn, gastronomic, magic, work, trestle, operating table etc… With the table, fixed or on a trestle, square, round or rectangular, it’s all about coming together. During the year 2016, the Castle of Saint Mesmin has present "The Lord's life" : the life of the castle owner. On summer, with an emphasis on fun, visitors were sure to come across the head cook, the great chef of the premises, but also the refined, smooth-talking dance master and finally, they are certain to meet the fencing master who will teach them that military activities are concerned with both war and peace. Fencing master: The fencing master is the personal trainer of the castle owner and all the men-at-arms of the castle. A knight, he is at the service of the lord and every day strives to maintain order and security. The training that allows a dubbed knight to become man-at-arms is challenging. These necessary steps require in-depth knowledge of heraldry, arms and armour, in addition to physical training and entertainment such as tournaments. Photos of 2015 The castle has put the emphasis on the “Children of the Middle Ages”. The life of children at the end of the Middle Ages was presented – children from towns, the countryside and the courts. From the country roads, passing through the courts of noblemen, between small jobs, recreation, apprenticeships and customs, these children from another time will have no more secrets for you. The child of the towns : More diverse, the world of the town child is that based around the street with all its resources that come with it, that of apprenticeships and indeed that of a middle class world. There is a sense of belonging to a guild, a brotherhood, a specific trade and to a rising elite which is the middle class. A turbulent world, more restricted, heralding already the early beginnings of an industrial society but also revealing the risks and dangers of town life. The child of the countryside (the fields): These children are in tune with nature (forests, rivers), the different elements (plant life, animals), the climate (natural risks, catastrophes) and the seasons. They actually assist the adults in their activities. Generally, the boys are given some responsibility, aiming to develop their physical condition, endurance and observation. The girls are responsible for the direct production process of the animals and plant life and the whole collection of faiths and superstitions. The child of the courts: From the young page to the prince, the child of the courts lives in a more restricted environment, more protected but also more rare. Should it be in the training of how to serve people in high places or as such managing himself, the child of the courts is obliged to take up a form of apprenticeship: that of the protocol, rules of etiquette, principals of courtesy, the legalities of public relations...Leisure time and entertainment make for a regular diversion from this didactic vocation: medieval verse (chronicles of heroic exploits), educational treaties, state costumes, all activities aimed at moulding the child early in life into a responsible adult. Is it a time to wage war ? The castle has projected a lecture on the effect of war on everyday life in the Middle Ages: Reflexion, anticipation, choice of action, organisation, innovation, defence and prevention will be the “key words”. “Daily battle”: How to prepare for the worst...How to survive the hazards of war, the climate, hunger, the cold, sickness. This daily battle is famous for the conservation of food resources, research and maintenance of military equipment. “News and accounts of war”: The war such that is told and illustrated by the winning side...The courage, the gallantry, the taste of the epic, the retelling of events, acts of bravery of some, treason and unreliability of others, the excitement of training and some spectacular demonstrations of individual prowess in tournaments and acts of weaponry. 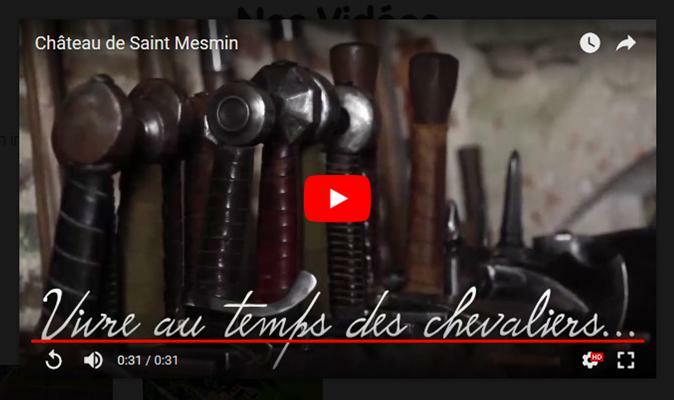 Saint Mesmin 's castle, the castle in medieval animations in Deux-Sèvres close Vendée not far from the Puy du Fou. 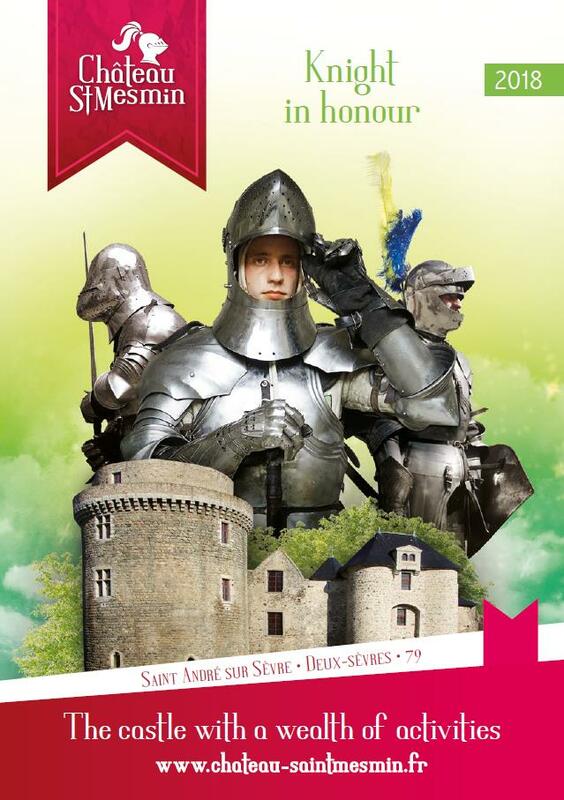 Castle to visit with your children such of real knights of the Middle Ages.